Purpose: This study was performed to evaluate the transverse strength of a denture base resin (H), repaired with an autopolymerizing acrylic resin (A) or a visible light-curing (VLC) resin (T) following the use of three chemical solvents: methyl methacrylate monomer, aceton or chloroform. Materials and Methods: Eighty specimens (65.0 × 10.0 × 3.3 mm) of H were fabricated and stored in distilled water at 37°C for seven days. Specimens were divided into eight equal groups of 10. In each group, specimens were sectioned in the middle to create a 10 mm gap. Two groups served as controls and had no surface treatment. They were repaired with A or T materials. In the remaining six experimental groups, specimen surfaces were treated with ac for 30 sec or mma for 180 sec or ch for 5 sec. Then A or T material was placed on the treated surfaces, using the same preparation molds. After seven days' storage at 37°C, the transverse bond strength (MPa) of the specimens was measured using a three-point bending test. A two-way ANOVA and a Tukey HSD were performed to identify significant differences ( P < 0.05). The nature of the failures was noted as adhesive, cohesive or mixed. Results: Significant differences were found between the controls and experimental groups ( P < 0.05). In the control groups, repair with A showed significantly higher strength (60.3 MPa) than those repaired with T (51.3 MPa). Mean transverse strength of experimental specimens repaired with A was (75.06 MPa) which was significantly greater than those repaired with T (67.9 MPa). Although surface treatment increased repair strength, no significant differences were detected between the effects of the chemical etchants. Conclusions: The autopolymerizing resin exhibited significantly higher repair strength than VLC resin. The transverse strength of the repaired specimens was increased significantly after chemical treatments. Background and Objective: Intrusion of natural teeth is a very common and interesting problem associated with implant-assisted fixed partial prostheses. Various theories have been put forth to explain this phenomenon, most of which revolve around the philosophy of exertion of excessive forces onto the natural tooth in a combination fixed partial denture. 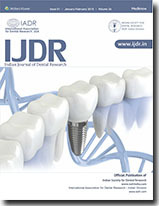 This photoelastic study examines the current theories revolving around intrusion and evaluates whether natural tooth intrusion is a definite possibility in an implant-tooth-connected fixed partial prosthesis. Materials and Methods: A two-dimensional photoelastic method was employed for testing and analysis. Two sets of photoelastic models were fabricated, one depicting a totally tooth-supported situation and the other an implant-tooth-supported situation. A rigid type and non-rigid type of connection were also incorporated into the fixed partial denture used in the both the situations in the study. Loads were applied on the anterior and posterior abutments and the pontic regions in both sets of models and the fringe patterns were photographically recorded for analysis. Results and Conclusion: The forces were proportionately consistent with the increase in applied loads in both the situations. The use of a non-rigid connection did not show any major significance but in fact may be erroneous. The forces were considerably higher in the implant-tooth-connected situation. The results indicated that the differences in the forces exerted were not light and continuous and may not cause tooth intrusion. Natural tooth intrusion may be caused by reasons other than excessive forces and needs further investigation. Orthognathic surgery is a well-accepted treatment for patients with skeletal discrepancies. The primary motivation of many patients who seek orthognathic surgery is esthetics and not for correction of functional disability. 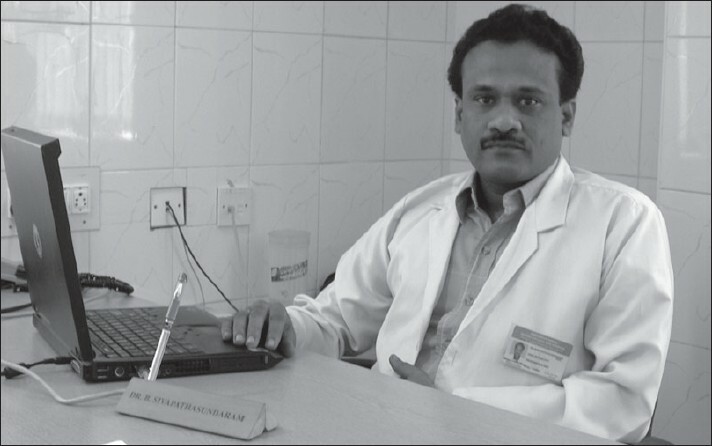 The treatment is incomplete if the surgeon attempts to correct the physical deformity alone without adequate understanding and regard for the emotional framework. The purpose of this study is aimed at patient's self-perceptions of facial form oral function and psychosocial function before and after orthognathic surgery. Fifty patients were included in the study, of which 21 were used as control. Twenty-two questions were asked to evaluate the problem in all four areas as mentioned earlier. Each question takes a score from one to five. In group I, the internal consistency of each scale indicates moderate to high internal reliability, ranging from α = 0.71 for general health to α = 0.88 for psychosocial problem. In group II, except for functional problems, the internal consistency of each scale has moderate to high reliability. 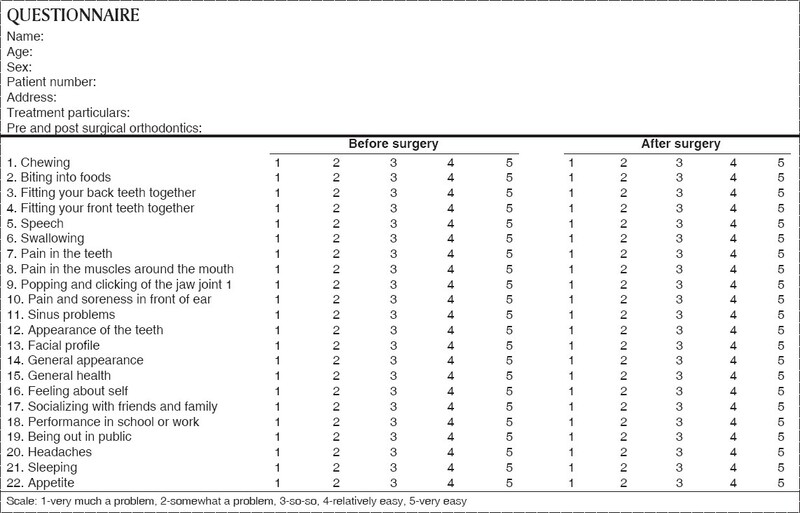 The psychological wellbeing of an orthognathic surgery patient is enhanced by careful preoperative counseling regarding the expected surgical treatment objectives, the operative course, and the expected postoperative sequelae. Patients who undergo orthognathic surgery readily accept the changes in their postoperative appearance and are satisfied with achieved results. Aim: To evaluate the effect of post reinforcement, post type and ferrule on the fracture resistance of endodontically treated maxillary central incisors. Materials and Methods: Sixty central incisor teeth were selected and grouped into six groups, viz. A, B, C, D, E, and F, each consisting of 10 specimens. Group A specimens were not subjected to any restorative treatment. Group B specimens were endodontically treated and crowned. Specimens of groups C and D were restored with custom cast post and core. 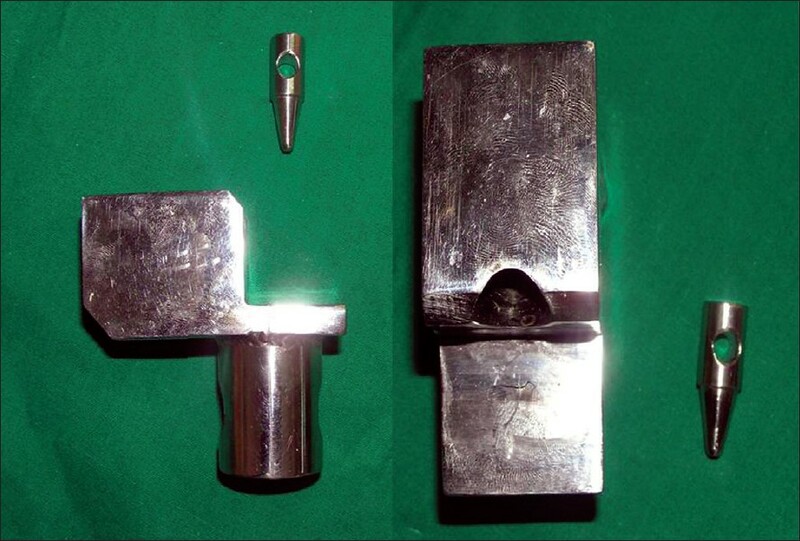 Specimens of groups E and F were treated with prefabricated titanium post and composite core. 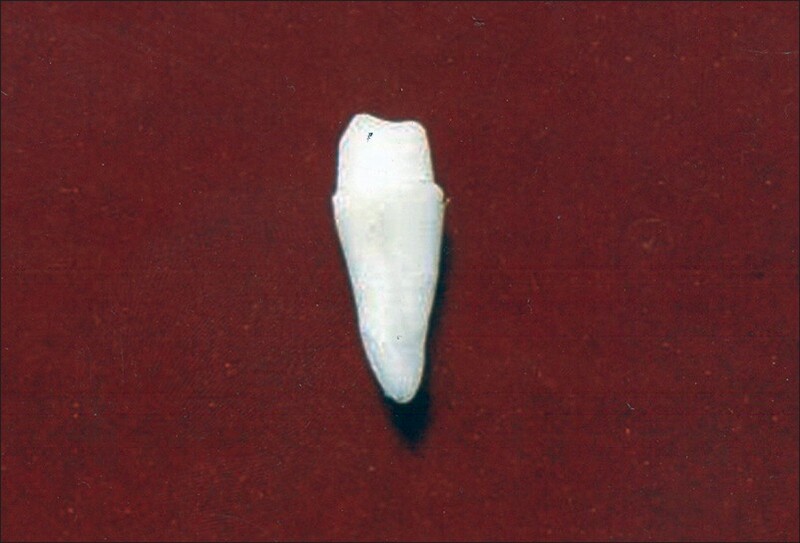 Specimens of groups C and E were restored with porcelain-fused metal (PFM) crown having 2 mm ferrule. Specimens of groups D and F were restored with PFM crown having no ferrule. All the specimens were subjected to load (newton, N) on the lingual surface at a 135° angle to the long axis with a universal testing machine until it fractured. The fracture load and mode of fracture of each specimen were noted. One-way analysis of variance with Tukey honestly significant difference procedure was employed to identify the significant difference among the groups at 5% level (P < 0.05). Results: There were significant differences among the six groups studied (P < 0.0001). The highest fracture strength was recorded with specimen of group C (1376.7 N). There were significant differences between groups A and D versus groups B, E, and F. There were no significant differences between groups B, E, and F. Cervical root fracture was the predominant mode of failure in all the groups except group A. Conclusion: The results showed that endodontically treated teeth restored with custom cast post core were as strong as the untreated group. Teeth restored with custom cast post core were better resistant to fracture than teeth restored with prefabricated titanium post and composite core. Ferrule is more important in custom cast post core than in prefabricated post and composite core. Background: Nonsteroidal anti-inflammatory drugs (NSAIDs) are one of the most commonly used medications for both medical and dental ailments. These drugs have been shown to increase bleeding during surgeries, which may prompt practitioners to discontinue their use before surgical procedures. The aim of the present study is to assess the effect of a common NSAID, ibuprofen, on bleeding during periodontal surgery. Materials and Methods: The study group consisted of 10 patients who were scheduled to undergo periodontal surgery of similar type, complexity, and duration. Each subject acted as control as well as case group. The case group consisted of 10 surgeries in which patients were administered ibuprofen prior to surgery, whereas ibuprofen was not administered in control group. 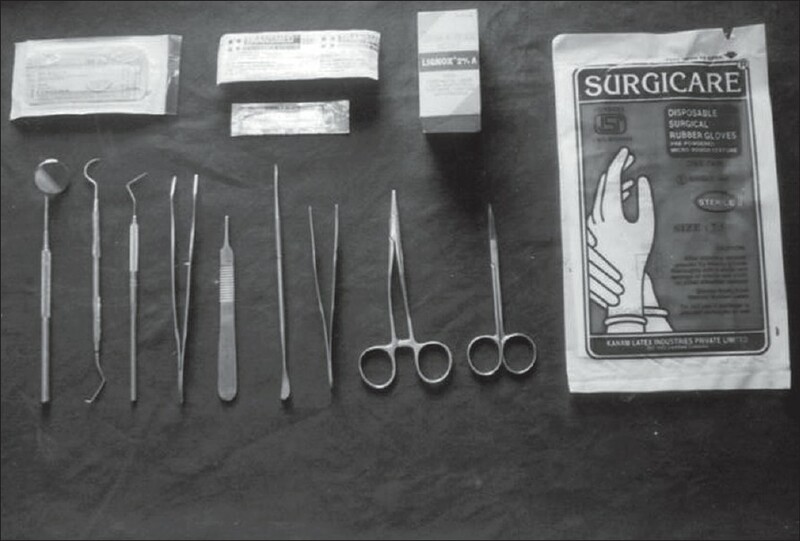 Bleeding time was measured at first visit and prior to first and second surgeries. The volume of blood loss during each surgery was measured by subtracting the amount of water used for irrigation from the total volume of fluid collected in the portable aspirator at the end of the surgery. Results: The result showed a statistically significant ( P < 0.05) increase in intraoperative bleeding during periodontal surgery when ibuprofen was preadministered. In addition, there was statistically significant ( P < 0.05) increase in bleeding time. Conclusion: Ibuprofen taken prior to periodontal surgery increases intraoperative bleeding and should be administered cautiously before periodontal surgeries. Antibacterial activity of a herbal dentifrice Arodent™ against Streptococcus mutans and Lactobacillus acidophilus was evaluated using Colgate® as standard. Both bacterial strains were isolated from the oral cavity on selective media and identified by standard methods. The antibacterial activity was assayed by cup-well method. The bacterial lawn of facultative anaerobe S. mutans was established between two layers of agar under microaerophilic conditions. Five and a half millimeters and 10 mm zones of inhibition were produced by Arodent against S. mutans and L. acidophilus , respectively, under microaerophilic conditions. On the other hand, the standard dentifrice Colgate produced 5.83 mm and 10.17 mm zones of inhibition against S. mutans and L. acidophilus , respectively, under microaerophilic condition. The results suggest that Arodent is an effective antibacterial herbal dentifrice. Aim: To examine the effect of three commercial mouth rinses (Hexidine 0.2%, Listerine Cool Mint, Betadine 1%) upon cultured human gingival fibroblast proliferation. Materials and Methods: Human gingival fibroblasts were cultured and incubated in Dulbecco's Minimum Eagle's Medium containing Chlorhexidine, Listerine, Povidone-Iodine at varying concentrations (1%, 2%, 5%, 10%, 20% and 100% of the given solution) at 37°C for 1, 5 and 15 min. Control cells received an equal volume of Dulbecco's Minimum Eagle's Medium without adding mouth rinses, for similar duration of exposure at 37°C. 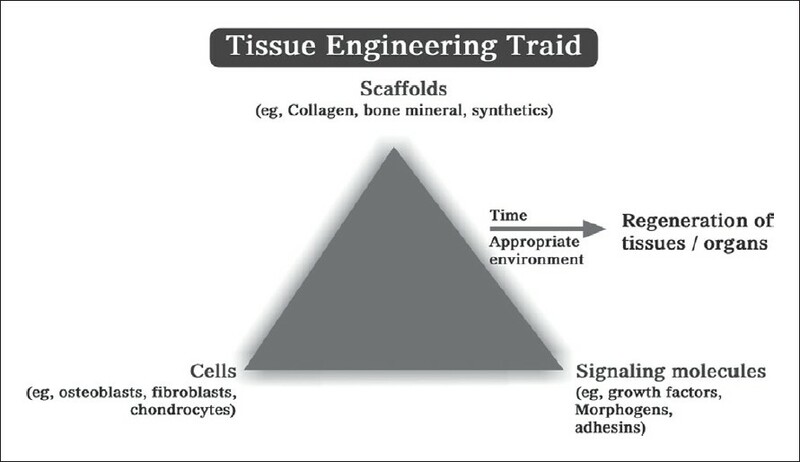 Following incubation the media were removed, cells were washed twice with medium, supplemented with 10% Fetal Bovine Serum, and fibroblasts in the test and control group were allowed to recover in the same media for 24 h. Results: In all the three groups, the proliferation inhibition was dependent on the concentration of solublized mouth rinses in the cell culture but independent of the duration of exposure to all three mouth rinses. The results showed that all three solutions were toxic to cultured human gingival fibroblasts, Chlorhexidine being the most cytotoxic. It was seen that at dilute concentrations (1% and 2% of given solutions) Listerine was more cytotoxic than Chlorhexidine and Povidone-Iodine. Conclusion: These results suggest that Chlorhexidine, Listerine and Povidone-Iodine are capable of inducing a dose-dependent reduction in cellular proliferation of fibroblasts. The results presented are interesting, but to know the clinical significance, further studies are needed. Background: The periodontal lesions with cellular proliferation can be assessed by various methods. One of the most recent methods to determine the proliferative activity is silver-staining nucleolar organizer region (AgNOR) staining. The purpose of the present study was to evaluate, if AgNOR count can act as a proliferative marker and can aid in the diagnosis and prognosis of periodontal lesions. 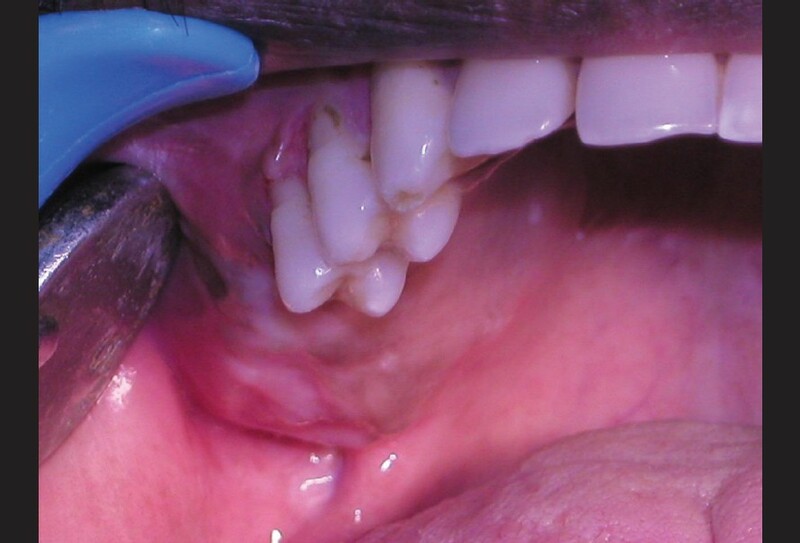 Materials and Methods: For this study, subjects with healthy gingival status, non-neoplastic lesions, neoplastic lesions, and plaque-induced gingivitis were included. Following the provisional diagnosis of clinical entity, biopsies were taken from the respective selected sites for histopathological diagnosis. In plaque-induced gingivitis cases, a second biopsy was taken from the selected sites 3 weeks following scaling. After histological confirmation, one more section was prepared, which was subjected to AgNOR staining, and AgNOR numbers were counted by individual and cluster counts and statistically analyzed. Results: Results showed the highest AgNOR count in neoplastic lesions. Non-neoplastic lesions showed a higher AgNOR count as compared to clinically healthy gingiva. Plaque-induced gingivitis showed a considerable reduction in AgNOR count after treatment. Conclusion: Results of this study confirmed that AgNOR count reflects the cellular proliferation and has a limited diagnostic value. However, the prognostic value of AgNOR for periodontal lesions is dependable. Platelet-rich plasma (PRP) is a platelet concentrate that has been used widely to accelerate soft-tissue and hard-tissue healing. The preparation of PRP has been described by several authors. Platelet-rich fibrin (PRF) was first described by Choukroun et al. in France. It has been referred to as a second-generation platelet concentrate, which has been shown to have several advantages over traditionally prepared PRP. Its chief advantages include ease of preparation and lack of biochemical handling of blood, which makes this preparation strictly autologous. This article describes the evolution of this novel platelet concentrate, referred to as PRF. Oral malignant melanoma is a rare aggressive neoplasm of the middle age. This malignancy commonly affects male subjects and is more frequently seen at the level of the hard palate and gingiva. At present, the clinicopathological classification of oral melanoma is not yet clearly outlined; consequently, the skin form is often taken as a reference. In many cases (up to 30%), the diagnosis of melanoma is made on lesions, which have evolved from the pre-existing pigmented lesions. The poor prognosis of oral melanomas requires that pigmented lesions of undetermined origin be routinely biopsied. 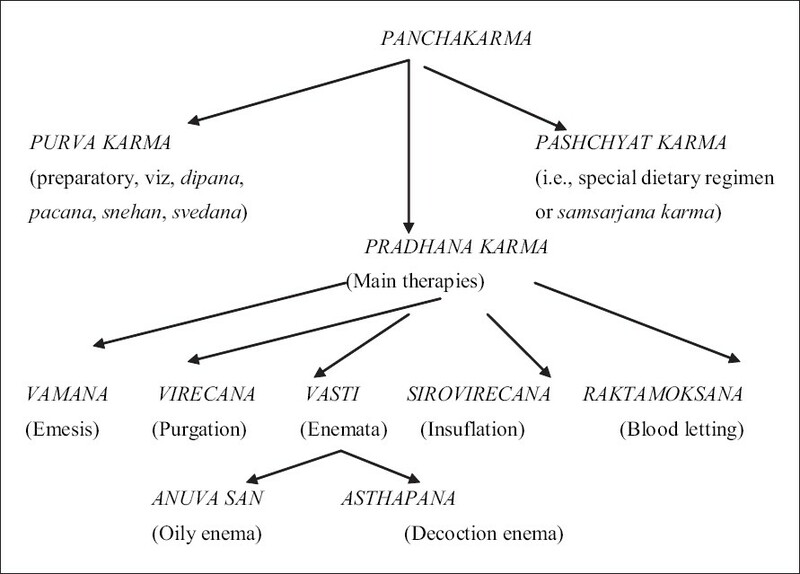 The surgical approach, combined with the chemotherapeutic one, is the first choice treatment. The purpose of this study is to review literature that has been published about malignant melanoma of the oral cavity. Materials and Methods: Thirty-eight published articles and 8 textbooks related to oral malignant melanoma and been published in the last two decades are reviewed. Conclusion: The review of literature in the field of malignant melanoma of the oral cavity show that this malignancy might be different from cutaneous malignant melanomas, and new criteria for diagnosis and therapy should be considered for this disease. Physicians and dentists who treat problems of the oral cavity should be aware of the need for early diagnosis of oral melanomas and performing biopsies of doubtful pigmented lesions. Odontogenic myxoma (OM) is a rare and locally invasive benign neoplasm found exclusively in the jaws. OM commonly occurs in the second and third decade, and the mandible is involved more commonly than the maxilla. The lesion often grows without symptoms and presents as a painless swelling. The radiographic features are variable, and the diagnosis is therefore not easy. A case of OM of the maxilla with unusual radiographic and histologic features is described in a 30-year-old male. A panoramic radiograph revealed a well-demarcated, multilocular radiolucent lesion with 'tennis racket' appearance involving maxillary antrum. The histopathology showed loosely arranged spindle-shaped stellate cells and few areas of inactive odontogenic epithelium in a mucoid intercellular substance. Ewing's sarcoma is an uncommon malignancy that occurs usually in childhood. 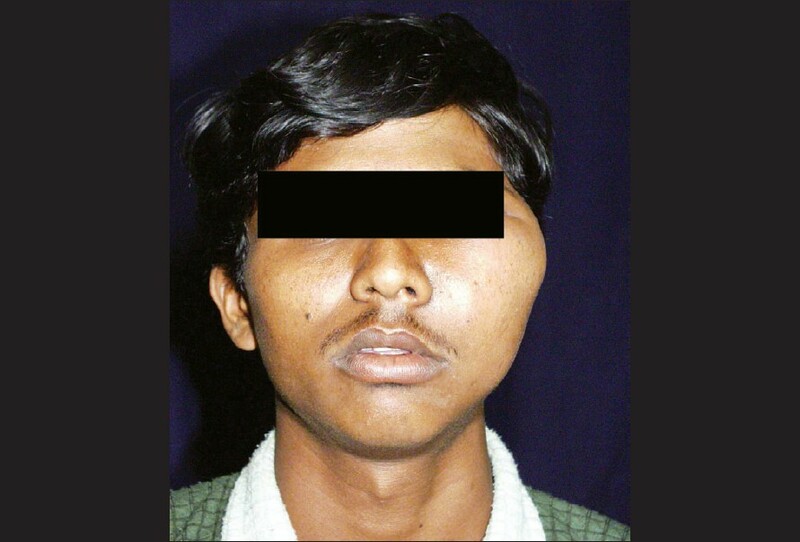 In most reported cases, the occurrence of this tumor is more in the mandible than the maxilla. 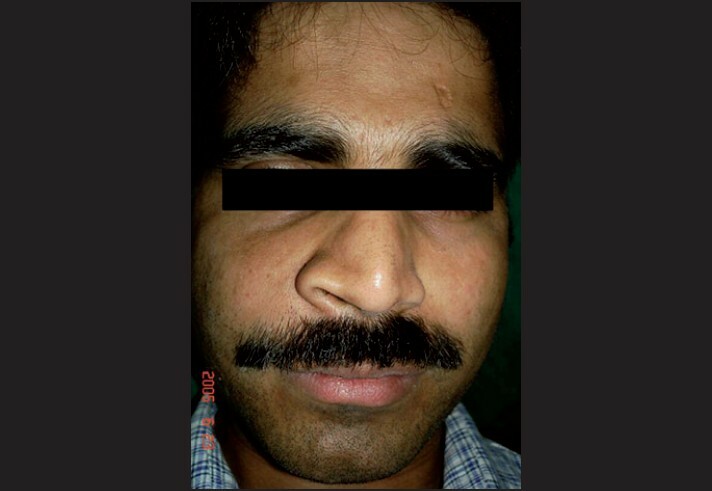 A case of Ewing's sarcoma of the maxilla together with its associated structures is presented and discussed with complete clinical, radiographic, and histological evaluation. Although the prognosis remains poor, an increased rate of survival is now associated with early diagnosis and combined therapy. Mandibular premolars have earned the reputation for having an aberrant anatomy. 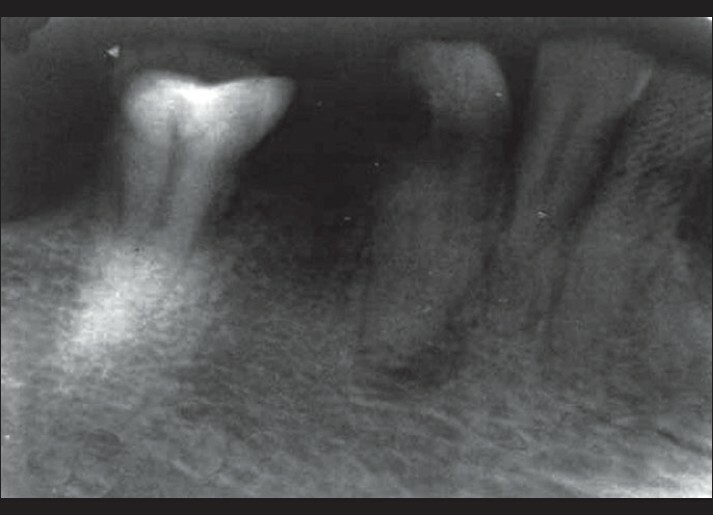 Literature is replete with reports of extra canals in mandibular second premolars, but reports about the incidence of extra roots in these teeth are quite rare. This paper attempts at explaining a rare case of successful endodontic management of a two-rooted mandibular second premolar with diagnostic, inter-operative and postoperative radiographic records along with a substantial data on the incidence of extra roots in these teeth. The standard method of radiographic appraisal was maintained as the criteria for determining the presence of extra roots. Totally, 600 patients were examined for a period of four months by three endodontists. Out of them, eight patients had an extra root in one of the mandibular second premolars and three patients showed a bilateral presence of two roots. Vegetable granuloma (VG) or pulse granuloma (PG) results from the implantation of food particles of plant or vegetable origin. It is usually seen in the periapical or in the sulcus areas. These lesions have been described as a distinct entity and classified into central and peripheral lesions according to the location. 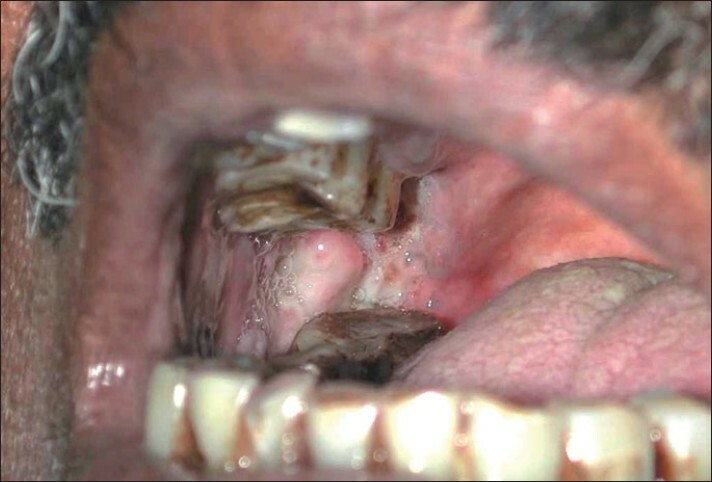 Central lesions are asymptomatic, whereas peripheral lesions present as painless sub-mucosal swellings. Many authors have postulated that food particles in VG or PG get implanted and are rapidly digested, and sometimes partly get altered by host responses. The cellulose part of plant foods being indigestible persists in the form of hyaline material, whereas the starch matter gets digested. This cellulose moiety invokes chronic granulomatous response. Central giant cell granuloma (CGCG) formerly called giant cell reparative granuloma is a non-neoplastic proliferative lesion of unknown etiology. It occurs most commonly in the mandible. The case reported here resembled a wide variety of conditions that led to a misdiagnosis both on clinical and radiographic examination but was histopathologically diagnosed as CGCG. We describe a case of central giant cell granuloma arising from the anterior maxilla to highlight to the general dental practitioner the importance of histopathology in the diagnosis of this enigmatic lesion.